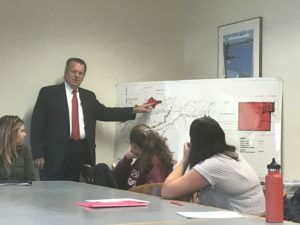 Attorney Alan Peterman instructing students about perhaps the only one outstanding native land claim in the United States. The claim involves the Mohawk/St. Regis people, on the border of Canada and the United States. The St. Regis people live on both sides of the Canadian-U.S. border and have free movement between both countries. Attorney Peterman also spoke of the Oneida Nation and the success of Turning Stone, and of the Onondaga Nation and the cleaning up of Onondaga Lake.